Remote controls sent to you - anywhere in the world. England, Wales, Scotland and Ireland. The USA and Canada. Africa and South America. Even to China. Remote Control / Fernbedienung / Mando a distancia / Télécommande / Telecomando. We call it different things, but is works the same. Made for your item. Not universal. No Setup - Just put your batteries in. 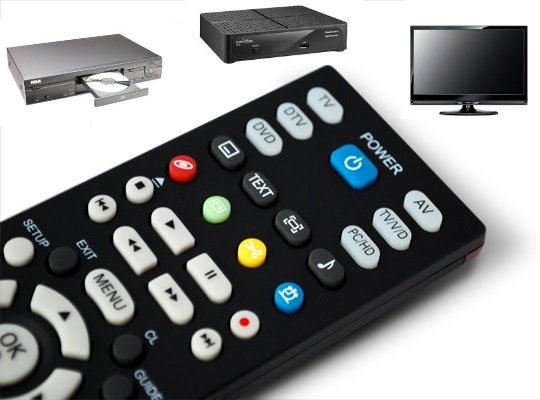 Each one is flash programmed for your specific device whether it is a TV, DVD, Blu-ray or Projector. You choose the TV / DVD / Digital Box that you want it to work, then we make it. Having two remotes, one for the TV and another for the soundbar is a 'first world problem', nevertheless a pain. We can make a single remote that will control both the soundbar and the TV fully. Dual Remote. No setup, we flash program it for you. Just select your models. 'Genuine' copy vs 'Common' copy. What's the difference? The mechanics of a remote control. What is involved in getting the remote control to send information. Replacement remote controls keep electrical items away from landfill for longer. Is that enough? Panasonic, Sony, Pioneer DVD "Hack" Remote controls. Ironically the cheaper dvd players can be made multi-region with simple remote commands sent from the remote that was supplied with the unit. Or they were already capable of playing discs from all regions straight out of the box. However, this is not the case for the more expensive Sony, Panasonic and pioneer units. Although you can send special commands from a palm-pilot or magic remote it is a difficult procedure. We have made a remote that sends all the commands in one simple key press. Such "chipped" remotes have been around for a good while but were usually one use only, rented and always expensive. Ours are only £9.99 and can also be used as a spare remote too as they have the standard play, pause, stop and menu functions on them as well. You can make up to 8 dvd players multi-region with this one remote. Remote controls - Design and assembly. As with many products on the market today, most of the manual work is done in China. We import all the cases and circuit boards from Changzhou in the Jiangsu province. The chips are made in Thailand and are akin to mini computers in their own right. Far more actually goes on in what seems like a simple remote control that you might think. The chips account for about 1/3rd of the total cost but their superior quality provide a fair degree of flexibility and much greater reliability. We have done all the design and development work here in the UK and program and assemble them in Herefordshire. After 3 years of development we have created the systems to enable us to produce a remote for a new device very quickly, sometimes the same day. Helpful considering that new TV & DVD models come and go in the space of a few months. In years gone by a television set may have been on the market in the same form for years on end. When you spend money on a remote control from us where does it go? Unsurprisingly the UK government get the largest share by far. The value does not include business rates nor employers tax. For each £1 earned £3 is paid in tax. Labour in the UK accounts for significantly more than in China. 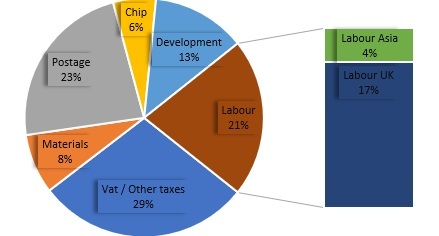 The bulk of the materials spend is outside of the UK, but is small compared with software development costs. Postal costs have more than doubled in the five years that we have been sending out items. We have enjoyed some of the cheapest postal rates in the world for a long time, but not any more. 'Other' includes overheads, paypal/visa/nochex card charges, ebay, amazon, ebid and web hosting fees and gross profit.